Khalid Abdullah Abunayyan has had an illustrious career at the Abdullah Abunayyan Group of Companies, rotating positions to obtain hands-on experience at the variety of companies owned by the family business. Khalid Abunayyan began in 1985 as a manager at MIS, specialising in water, wastewater and agriculture products. In 1989, he was appointed general manager at Saudi French Company, a joint venture formed two years earlier between Abdullah Abunayyan Establishment and Emerson Group specialising in maintenance of electric motors and alternators. In 1993, he became general manager of United Food Company, where he spent seven years expanding the Pizza Inn franchise across Saudi Arabia, Qatar and Bahrain. 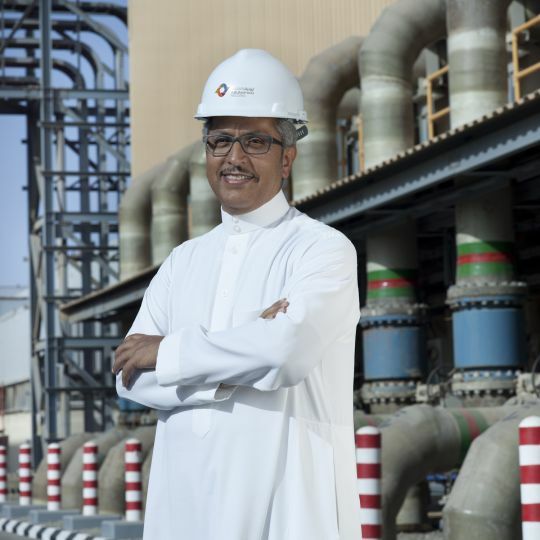 Concomitantly, in 1990, he has been assigned the responsibility for a takeover of Abunayyan Electric Corporation (AEC) and remained general manager for 11 years, developing the company to become the market leader in Saudi Arabia specialising in power distribution, industrial controls and data communication products. The same year AEC was founded, Abdullah Abunayyan Establishment converted to a limited liability company and Abdullah Abunayyan Trading Corporation (ATC) was created. Abunayyan took over the general management of ATC in 2001, transforming it into one of the region’s leading companies specialising in water, wastewater, power, instrumentation & control and logistics solutions.He became president and chief executive officer of Abunayyan Holding in 2007. Abunayyan is a member of the National Trade Committee in the Council for Saudi Chambers of Commerce and Industry, as well as sitting on the boards of various companies in Saudi Arabia and the wider region. Abunayyan earned a B.A. degree in Business Administration & Computer Science from Western Washington University. He is married with four children.